CouchWarriors x NekoCards: Smash 4 + FGC Fortnightly – Couchwarriors is teaming up with the great people at Nekocards to present the FGC with an awesome night of fighting game goodness. Entry is buying a booster pack of any TCG stocked by Nekocards, which is from $4 (plus you get to keep the booster pack!) For Smash 4, there will be a tournament from starting at 5pm, with a 48 man cap. Guilty Gear + Dragonball + other anime fighters will have friendlies throughout the night. We regularly host fighting game tournaments and gaming sections at convention events. 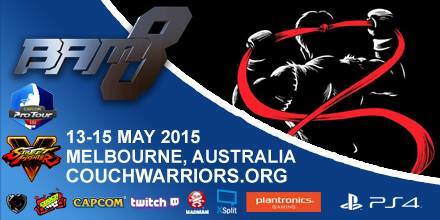 These include Madman Anime Festival, PAX Australia, OzComicCon, Animaga and more.